Happy Monday! I’m very pleased to introduce Lauren Salkeld, guest blogger for this week’s post. As a senior editor at Epicurious.com, Lauren develops, tests, and edits recipes, and writes about various cooking techniques, from making homemade marshmallows to deep-frying a turkey. You can follow her on Instagram (laurensalkeld79) and Twitter (@laurensalkeld). I’m thrilled she’s contributed this delicious yet easy-to-make recipe, combining some of my favorite ingredients. 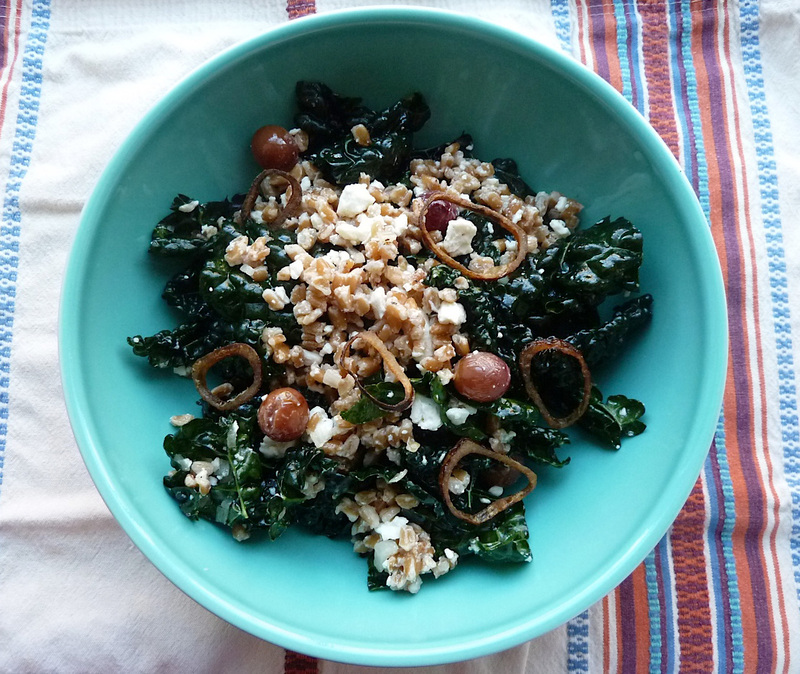 This farro and kale salad came about when I was creating a menu for a friend’s baby shower. I love grain salads because they can be made in advance—some even taste better on the second day—and can be served at room temperature, which are two really important things when you’re the only person cooking for a party, which for me is often the case. Grain salads are also really flexible, so you can add in whatever ingredients you picked up at the farmers’ market, or the ones you happen to be really into at the moment. I’ve developed a bit of formula for mine, which goes something like this: grain + green + veggie or fruit + cheese + nut or seed. And I typically add some kind of homemade pesto or a shallot, olive oil, and lemon juice dressing like the one used here. This version is great as leftovers, and I bring it to work for lunch all the time, but you may want to leave the crispy shallots and walnuts on the side until you’re ready to eat, because otherwise they can get a little soggy. 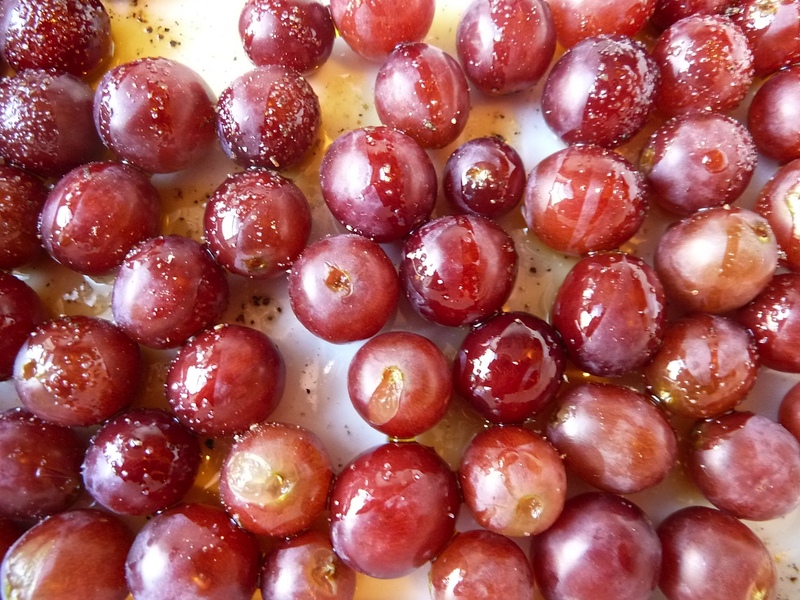 In a baking dish, combine the grapes with 1 tablespoon olive oil and season with salt and pepper. Roast until slightly shriveled, about 1 hour. Let cool. Peel the shallot and slice it crosswise into rounds. Remove the first 2 or 3 large outer rings of each round and set them aside. Mince the rest of the shallot (the smaller inner rings). In a small sauté pan over medium heat, warm 3 tablespoons olive oil. Add the minced shallot and sauté until softened, about 2 minutes. Transfer to a small bowl and let cool. Once cool, add the lemon juice and whisk to combine. Place the kale in a large serving bowl, add the lemon juice-shallot-olive oil mixture and use your hands to massage it into the kale. Place the flour in a small bowl. Add the reserved shallot rings and toss to coat the shallot rings in flour. In a small sauté pan over medium heat, warm the remaining 2 tablespoons olive oil. Working in batches, shake any excess flour off the shallot rings then fry them in the hot oil, flipping once, until just crispy, 30 seconds to 1 minute. Transfer as fried to a paper towel-lined plate to drain. 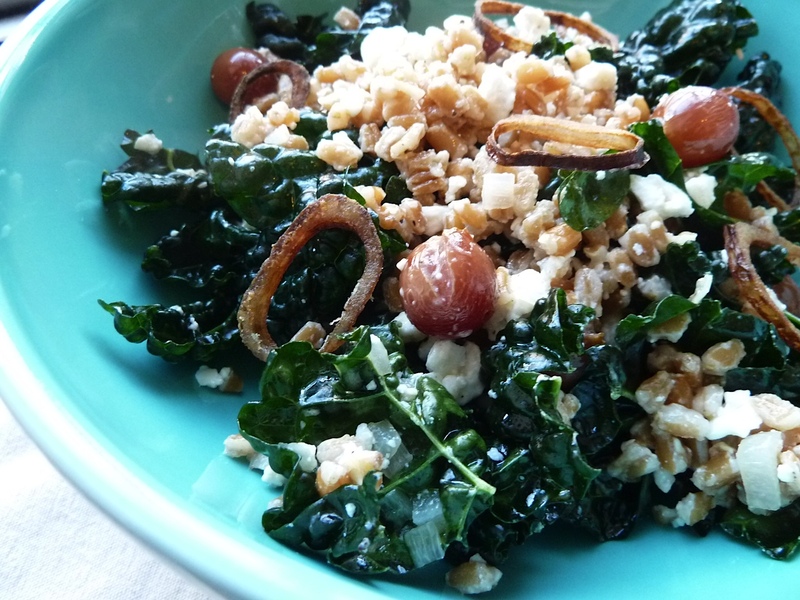 Fluff the farro with a fork then add it, along with the grapes and ricotta salata or feta, to the kale and toss to combine. Season to taste with salt and pepper. Top the salad with the crispy shallots and toasted walnuts, if using, and serve.